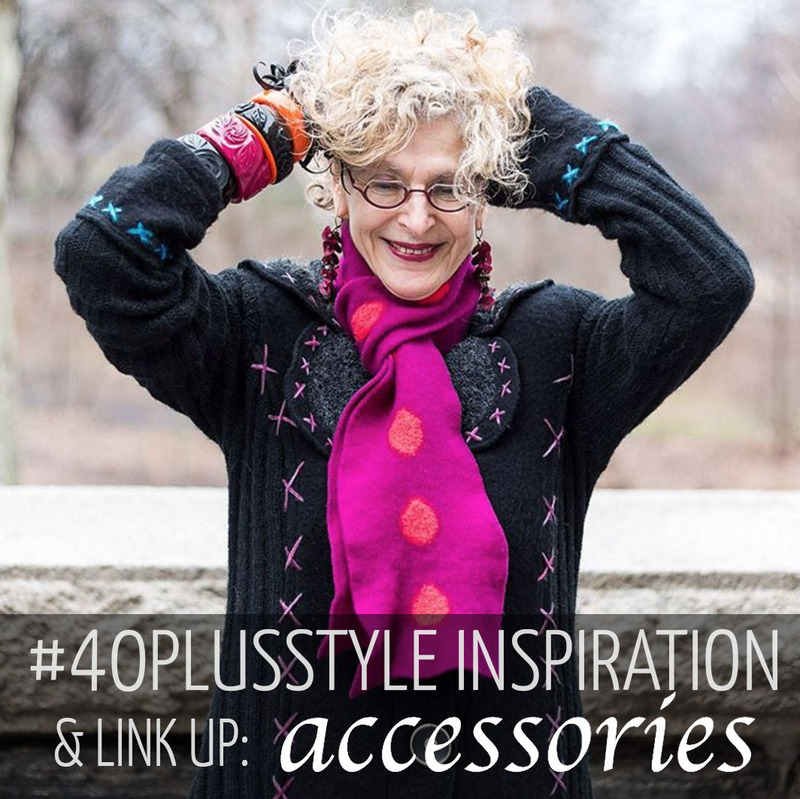 40+ Style » What you wore » #40plusstyle inspiration: Accessories – which is your favorite look? #40plusstyle inspiration: Accessories – which is your favorite look? Accessories make every outfit special. In this week’s #40plusstyle inspiration we feature lots of looks where accessories play a major role. Our cover girl Dayle previously featured here always uses accessories to great effect and has a very bold accessory personality. Of course if you want to learn a lot more on how accessories can improve your style, I welcome you to enrol in my special course: Accessorize Me Confident & Beautiful. It's officially the beginning of Autumn and 34 degrees in Adelaide today. I am participating in the @stylingyou March challenge to incorporate elements of autumn in my wardrobe #SYAW16. So on a hot day like today my new Camilla #flightful #elduende provides some lightweight coverup whilst still maintaining my cool. It goes perfectly with this @rawbyraw citrus toned skirt I picked up on sale a couple of weeks ago. I am also wearing 2 layers of my @melapurdie white mousseline tanks as they can be a bit see through. 9. Scarves can change an outfit’s look in an instant and you’ll definitely stand out! For many more looks check out #40plusstyle on Instagram. Do you want to be featured next? All you need to do is follow me on Instagram and add the #40plusstyle hashtag to any instagrams you post. Please use this hashtag for sharing yourself in your outfits only. It’s a fun way for everyone to easily browse through all the fabulous looks by 40+ women on Instagram. Please note that there is no theme for these images (the week’s featured theme on this site will be inspired by a previous style star or a streetstyle image we have taken)! Join the #40plusstyle inspiration linkup and show me your fashionable accessories looks! Everyone can participate right now by adding their own looks to this page. Just make sure you have an image on a page somewhere online. Link to your outfits with the simple tool below. They can be new or old, just make sure it features a coat, cape or poncho. If sharing from a blog post, it would be great if you can link back to this page so other women can benefit from the inspiration in this linkup too. I look forward to seeing all your looks! How do you wear your accessories? Which one of these looks is your favorite? Wow, Sylvia! Such a wonderful and eclectic mix of women who express themselves through their unique styles! I am honored to have been included! Thank you so much for your contnued support! Oh, so many fabulous and stylish looks! I always enjoy finding new inspirational over 40 bloggers here. SO many gorgeous accessories to peruse this week, as well. Conny Doll’s necklace really caught my eye – amazing! I drooling over the gown of wardrobemistresssg. Great collection of stylish women! I already follow most of them on IG but will check out the rest! Thanks so much for the mention Sylvia! What fabulous bloggers also! So much joy and great friends. Thanks for including me in this great round up! I think my fave is Connydoll’s collar necklace—talk about a statement!! What a fantastic examples of accessorizing! And great outfits! Love them all. No lie. Thanks so much for the inclusion Sylvia. Honoured to join such a stylish and creative line up of inspiring women! Elizabeth (timeless styling), Conny (connydolllifestyle) and Suzanne (carillo) are ladies after my own heart. Go bold. Such beautiful statement necklaces from all of them. I love playing with accessories. They are a simple way of lifting an outfit. Ok, I love accessories, so I am loving all of these great looks – what a great round up of fun! If I have to pick one though, it would be Suzanne – those jeans, the belt and necklace all wrapped with come color, she really knows how to make a look pop and here she bought those fabulous jeans to life! Thanks for another fun round up!